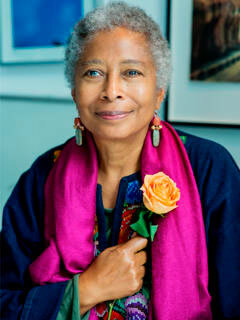 Alice Walker is one of the most prolific and important writers of our time, known for her literary fiction, including the Pulitzer Prize–winning The Color Purple (which was also a major Broadway play), her many volumes of poetry, and her powerful nonfiction collections. She is the author of We Are the Ones We Have Been Waiting For, Possessing the Secret of Joy, The World Has Changed (edited by Rudolph P. Byrd), The Chicken Chronicles, The World Will Follow Joy, and The Cushion in the Road, all published by The New Press. Some of her other bestselling books include In Search of Our Mothers’ Gardens, The Temple of My Familiar, By the Light of My Father’s Smile, and The Way Forward Is with a Broken Heart. Her advocacy on behalf of the dispossessed has spanned the globe. She lives in Northern California.